I contacted multiple wedding planners in Cyprus. 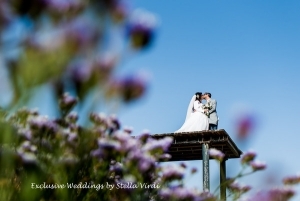 Stella Virdi was FABULOUS from the first minute and that’s how we settled on Paphos as a venue. She listens carefully and fully adapted her recommendations to our wedding style and budget. We found very quickly the perfect venue, cocktail and dinner place, as well as a fab makeup and hair artist, photographer, flowers, live music, and transport company. She even gave us her suggestions for accommodation places as well as restaurants for our holidays in Cyprus after the wedding! Needless to say, she also smoothly navigated through all the paperwork required to formalize our union. Throughout the wedding day she made sure everything ran smoothly while keeping the fun. 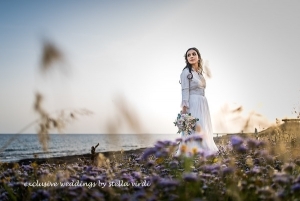 Moreover, Stella helped me before the wedding day with the last minute unexpected hurdles such as fixing the length of my dress with a tailor and even getting to the hospital on time to prevent a potential sty on my eye! Super professional in her budgeting (with pricing options for every budget and no hidden fees). Always ready to help us both from the distance (we planned from abroad) and on the ground! Stella pulled of a wedding day beyond our best dreams!!! We could not be more grateful! We are just so happy with the work of everyone on the team! Also special shoutout for the tailor, Maria (the makeup/hair artist), the violinist (never got to thank her but she was soooo good. The flowers where wonderful and exactly as I dreamt too. Plus Judy was so nice and professional with the Taxi service. Thank you very much for giving us the wedding of our dreams.